Have a gander at these here numbers: I now have 1,020 Goodreads friends! How did I manage this, you ask? Well, about a week ago, I had 200 friends, as a result of a year of giveaways (total of 8, which are also responsible for the staggering 2,424 of my books on people’s to-read shelves) and also because of two months of madness advertising #ComedyBookWeek. Then I discovered something most of you probably already know. Goodreads lets you connect to your friends on other social platforms en masse. Click on each platform’s icon and send out invites by clicking on “Add Friends” button. That’s it. Now they all will see your general updates, comments you’ve made in groups, and you can invite them to your groups or events. Like, I dunno, you can invite them to #ComedyBookWeek group. Just sayin’. So I found a different work-around. Cause I just don’t take “no” for an answer and cause I feel omni-potent, having learned the very basics of HTML. Also, probably, cause I’m Russian-born, and we’ve been known to fix space stations with hammers. In movies, mind you, but that’s probably not that far from the truth. Have a look at the picture above – it is basically the naked HTML that was visible above the “Goodreads Giveaway” title. That’s the link to the actual entry form. Unless you want to keep it, but I prefer the cleaner look, which goes to the giveaway page. A. I found the “text-align: center” and changed it to “text-align: left” to match my other widgets. That’s it! Once you are happy with the way it looks, move the widget to the desired position, and voila! It looks great in my sidebar now. Best Goodreads Giveaway yet – #24 on Most Requested list! I still can’t believe it! My second giveaway for Shizzle, Inc lasted two weeks and it was requested by 1,699 people – enough to make it onto the front page of the Goodreads Most Requested list, and even climb up to #24 (there are 30 on the first page). Thank you all who’d entered – especially those who answered my plea on Twitter earlier today, when it was 37 requests or so away from making it to the front page. Amazingly, nearly 300 people requested it today alone. 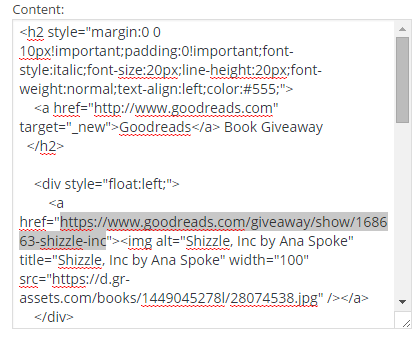 I have added a new column to Shizzle Goodreads giveaways spreadsheet, to track how many followers I get – I was not paying attention to that number before, big mistake! I have not filled in the total cost to me – which will be huge, since the winner is in Romania and I have to get the book there within 4-6 weeks. Did you know you can look up this chart for any book on Goodreads? It’s in the top right corner of each book’s page – look for “stats”. Just today, 175 people added it to their “to read” shelves! You should open the giveaway to the entire world. Interestingly, the second giveaway started slower, but had more daily adds in “the middle”, the normally dead time. It is better to have two short giveaways than one long one. Heck, my short one doubled the performance of the long one! Any guesses why? Is it because it was open to all countries? I have another guess – it is actually better to give one copy than multiple. I know, I know, everybody says to give as many as you can, but I spent hours looking at most requested and least requested books, and I have a gut feeling that giving multiple copies (some people give away 25!) creates a feeling that the book is not that special. Giving one, and preferably autographed, copy creates the opposite effect – that you are competing for something rare and special. Another thing I’d learned from looking at other people’s giveaways, that they don’t do one, or even two of those – some of the very popular titles have been on practically constant giveaways. I’m about to schedule another one, and want to test one of the factors – I’m thinking another two weeks, all countries, one copy, but this time unsigned. Does the word “AUTOGRAPHED” have any effect on the numbers? I will let you know in about three weeks! Matthew FitzSimmons himself stops by to explain the mystery of Short Drop reviews! It was late last week when I posted Riddle me this! – a question about how it could be possible for a book to have a ton of reviews before its release. The book in question was Short Drop by Matthew FitzSimmons, an overall #1 on Kindle, with 1,388 reviews at the writing of this post, and the release date of 1 December. I was not the only one confused – the post generated quite a discussion and a number of hypothesis, but it was a consensus that the reviews were a result of the book getting picked up as Kindle First. Is this the first time you’ve heard of Kindle First? Well, that makes two of us. Visit Kindle First website to learn more. Just don’t get too excited if you, like me, are in Australia – for some reason it’s not available down under. So there you go folks – a mystery solved, new lesson learned, and another proof that you should never, ever give up on your dreams. I’m off to do some writing. I hope you do the same.